Americana – You Do Hoodoo? 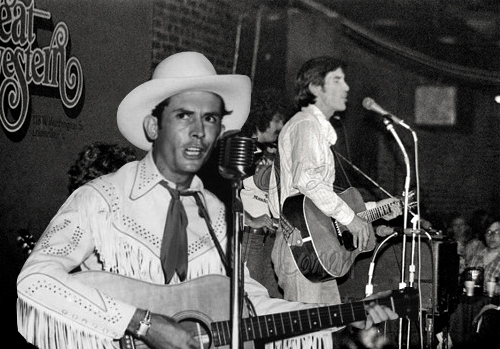 Today, January 1st, marks the anniversary of the deaths of two great American songwriters, Hank Williams in 1953 and Townes Van Zandt in 1997. In addition to their coincidental departure dates, these two shared a lot in common. They were both long and lanky long gone daddies with dark hair and eyes, and they both had what my granddaddy called “jug ears.” In fact, judging by these two accompanying photographs, I suspect that a DNA test would discover a shared ancestor in the not too distant past. More significantly, they also possessed the rare ability to create memorable melodies with song lyrics that can stand alone on a page without musical accompaniment. The midnight train is whining low. And nothin’ is too much to bear. Where you’ve been is good and gone. All you keep’s the getting there. Well, to live is to fly, all low and high. And the sleep out of your eyes. [The tragic vision] recalls the original terror, harking back to a world that antedates the conception of philosophy, the consolations of the later religions, and whatever constructions the human mind has devised to persuade itself that the universe is secure. It recalls the original un-reason, the terror of the irrational. It sees man as questioner, naked, unaccommodated, alone, facing mysterious, demonic forces in his own nature and outside, and the irreducible facts of suffering and death. Thus it is not for those who cannot live with unresolved questions or unresolved doubts, whose bent of mind would reduce the fact of evil into something else or resolve it into some larger whole. Like their artistic archetype Edgar Allan Poe, throughout their abbreviated lives, they were besieged by “demonic forces in their own natures,” and like Poe, they attempted to neutralize those demons through drink and more exotic drugs — in Hank’s case, chloral hydrate and barbiturates, and in Townes’s, codeine and heroin. However, when it comes to self-destruction, I don’t think either EA or Hank could hold a candle to Townes Van Zandt. Supposedly, Poe gambled to augment his stepfather’s meager allowance, but in Townes’s case, his gambling seemed a deep-seated masochistic addiction. According to John Kruth’s biography, To Live’s to Fly, not only did Van Zandt literally lose shirts off his back, but in one card game, he also lost his gold dental inlays, which he pulled out with pliers and delivered on the spot as payment. He also had the propensity to give all his hard earned money away to winos after getting paid for a gig. Like a crazed character out of Dostoyevsky, he seemed to seek out suffering, perhaps for the sake of his art. like a stick-stirred rattlesnake’s nest. wrong might not be wrong.